Ros Ereira, Time Team cameo producer, explains how a draco was made for the Drumlanrig programme cameo. The Draco was a Roman military standard. Initially used by the cavalry, its use eventually spread throughout the army. 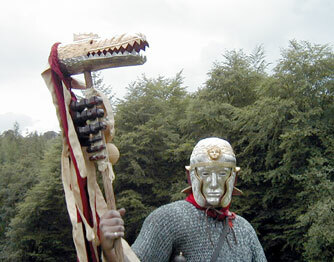 It consisted of a dragon head made of a copper alloy, held in the air on a pole, and with a body/tail made of fabric, which would blow out behind the head when carried on horseback. We also know from written sources that the draco made a noise. This noise is perhaps the most intriguing feature of the draco. Despite the fact that we know from the written sources that the draco was a common standard, very few clues survive about how they were constructed. The best example was found at Neiderbieber in Germany, but even there, all that survives is the copper head of the draco. I decided that Time Team should try to find out more about how the dracos were made, and how they might have made a noise. Could we hear a sound that has not been heard for 2000 years? Making the draco has 3 separate elements. Each of these elements has its own inherent problems, and degree of interpretation required. Also, our draco had to be made and demonstrated within 3 days. 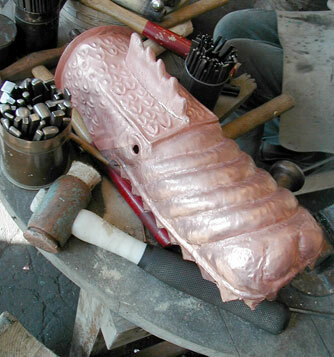 The head of the draco was made by Tim Blades. 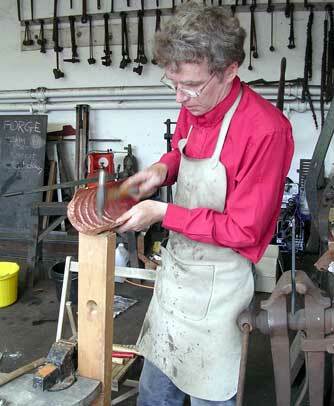 Read how Tim Blades made the draco head. Dr Wegner at the German museum that holds the Niederbieber Draco tells me that the original was made from a copper alloy, not quite copper, and not quite modern bronze. This means that to have a draco made with the exact metallurgy of the original would involve making our own metal, which seemed a bit extreme. This means that we could choose between copper and bronze, and Tim decided to go with copper, as it is easier to work in the time given. The original has had different treatments on the top and underneath the head. The underneath is tinned, and so we tinned ours too. The top of the original was fire-gilded. This means it was covered with a mixture of gold and mercury. We couldnt repeat this process without a specialist laboratory due to the mercury, so Tim electroplated our draco to give it the gold plated effect. The head was made in 2 parts, which were riveted together. Like the Niederbieber original, the eyes were left hollow. No tail has survived, so we had even less to go on. 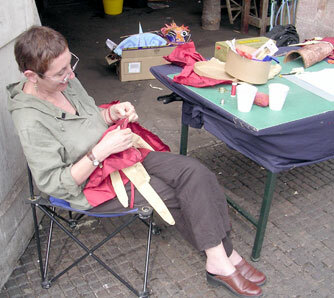 Valerie Hancorn is a kite-maker, and made the tail. The tail is very complicated, as it needs to be light enough to fly, but long enough to fulfil its function. Valerie made it from red and gold silk, and covered it in little tails, as depicted in the Trajans Column carving. We chose silk because it was a high-status item and silk is light, and yet is dense enough to contain the air passing through it. The Trajans Column carvings are the only Roman period pictorial reference we have for the draco, and other than these, we had to rely on written descriptions of the tail or later images. Valerie sewed the tail entirely by hand. A strip of chamois leather was used to strengthen the silk around the opening of the draco head, to prevent the metal cutting through the fabric. The tail is attached to the head by means of a drawstring, so it can be removed as necessary. After looking closely at the Trajans Column carving, Valerie decided that the end of the tail should also tie closed. This meant that we could experiment with having the end open or closed. The tail flies better when the end is closed, but we wanted the option of opening it in case this made a difference to the sound when we were experimenting with putting the whistles inside the head. The tail was 9 long. This is the most mysterious part of the draco. Of the replicas made before, I dont know of any that have made a noise, despite the fact that the sources refer to a sound. This suggests that some part of the draco has not survived, and we need to try to work out what that was. Peter Taylor (a kite expert) tried out various ideas. Read how Peter Taylor managed to get the draco to make a noise. The best surviving example of a draco is in the Mainz museum in Germany, (the Niederbieber draco). We worked closely with the Mainz museum on this project, and were sent numerous photographs and drawings of the original. We could find absolutely no surviving signs of any fittings for any noise making devices. This is in spite of the draco being in exceptional condition. The holes that exist in the lower jaw and in the top of the head are simply for the pole to fit through. One of Peter's first ideas was to try an Aeolian harp, but these need to be quite large to work well, and so seem to not fit anywhere on a draco standard. It just wouldn't make enough sound, and one on the outside would just be too fragile. We even looked into the possibility of this pole being hollow, and the air rushing over the top of it blowing it like a digeridoo! After talking to some makers of woodwind instruments, we concluded that a reed was not the answer. A reed is simply a squeaker, and it is the shape of the instrument that allows that sound to then resonate. The head of the draco is not an appropriate chamber for this to happen. As we have a surviving draco, we know the shape of the metal head, and that it cannot work in this way. The best idea we had was based on whistles. Peter knew about Chinese kites, which have built-in whistles. These whistles are an ancient technology, consisting of a sort of spherical seedpod with a slit across the front. Ancient Chinese archers used whistling arrows based on the same technology, and we also know that whistling arrows were later used in Europe. These whistles are known as an ancient technology, and as such are at least contemporary with the draco. We also know that the technology did, at some point, come to the west, as the same kind of whiltes were used on whistling arrows in East and West alike. Also, it is thought that the draco itself may have come from the East originally. It is tought that it came to Western Europe brought by the Sarmatians. and it seems that they might have taken it from as far east as China. We considered lots of noise-making possiblities... It seemed a viable technology to be using in our draco experiment. Peter attached some of these whistles to a pole, and found that that made a fantastic sound when swung around at speed. A variety of whistle sizes were used, and we found that the largest ones would work at a lower speed, while the smaller ones would make a very eerie sound. We decided to use a combination of sizes to maximise the chance of getting some sort of sound, and to get the best sound if the wind speed is high enough. We were not able to find out until the last day whether or not these would work when arranged inside the head, and we were rather disappointed when we found that they made no sound at all. This seemed to be due to the teeth in the mouth of the draco causing air turbulence that prevented the air travelling smoothly over the whistles. Not only did this cause the whistles to stop working, italso did seem to prevent the tail flying. The only obvious solution was to try them on the outside. Perhaps given more time, we might have found a different solution to this problem, but the solution we did come up with worked beautifully. Peter fixed the whistles in groups onto wooden panels, which in turn were fixed onto the pole on either side, below the head of the draco. This looked remarkably similar to other Roman standards, with the various decorations arranged down the pole. 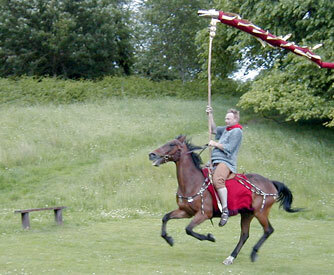 The draco was used by Alan Larsen, who rode in Roman saddlery on an appropriately small horse. We found that a good sound could be heard even at the walk if he was riding into the wind, and when he galloped into the wind, the noise could be heard over the sound of the horses hooves for a distance of at least 200 metres. The noise was definitely eerie, and could feasibly be described as hissing. The noise-maker worked brilliantly! It could be heard about 200 metres away, and was definitely 'eerie!' The different tones of all the whisles worknig together gave a very weird sound indeed. Of course, it was even louder when riding into the wind. The noise was surprisingly loud , but "Murphy" the horse was fine -we had previously tested him with similar whistles. We used a pole 9 long (longer than usually shown in contemporary art), so that it was the same length as the tail, which would otherwise have dragged on the ground. We suspect that artistic representations simply needed to fit the draco into a smaller space. Alan found that he did not have the strength to hold the pole without support when the wind was dragging it, and found that the best way to carry it was to wedge the base of the pole against the front of the saddle, next to his thigh. On subsequent occasions it was placed in a small leather cup strapped to the front of our Peter Connolly saddles. This also meant that when the horse was at rest, the pole carried at an angle in a resting position and the tail was hanging down, the tail was still clear of the horses hooves. Making the Time Team Draco is Copyright � 2005, Channel 4. All rights reserved. Used with permission. 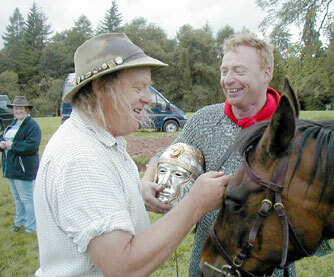 Phil with Roman horseman Alan Larsen.